I’m always in search of the perfect granola. I am not going to stop until I find it. To me, the perfect granola has to have a few key characteristics: it must be crunchy, it must have clumps, and I’d like it to be healthy(ish). This granola meets all of my criteria. It is definitely healthier than most granola since it is fat-free without any oils or butter. It is also very crunchy and has some clump in it too. The only thing I have to work on with this recipe is that the middle of the baking sheet doesn’t cook at the same rate as the outside. This means that the outside gets brown and crispy before the middle of the sheet. I think if I just took the outside of the granola off the sheet and put the rest into the oven again this would fix the problem. I will have to try this next time. 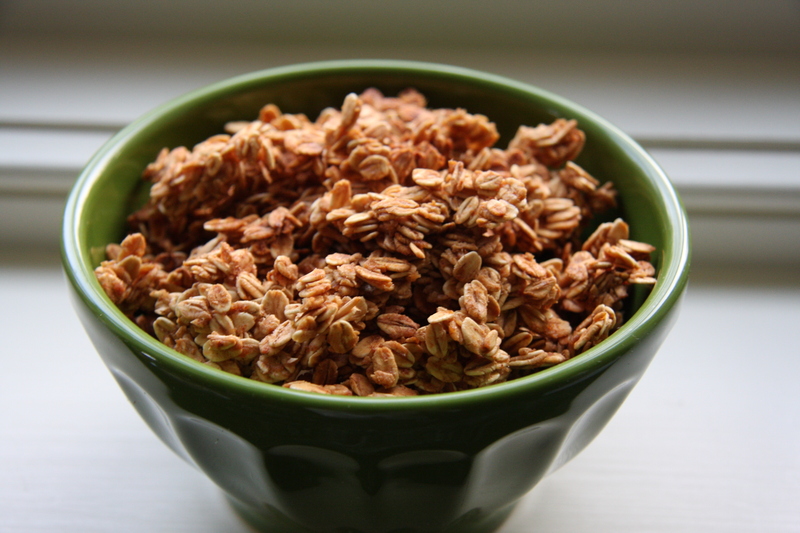 You will probably see a lot of granola recipes on this blog as I continue to search for my perfect, go-to recipe. And, since I need to have granola on hand at all times, I will be trying new recipes and cooking techniques pretty often. Preheat the oven to 325 degrees F. Line a large baking sheet with parchment paper or us a Silpat mat. In a large bowl, combine oats, cinnamon and salt. Mix well. In a medium bowl, whisk together brown sugar, applesauce, agave syrup and vanilla extract. Pour wet ingredients into oat mixture and stir until oats are evenly covered. Spread the mixture evenly on the baking sheet. Bake for 20 minutes, and stir oats on the baking sheet. Bake for another 15-20 minutes, or until the granola is golden brown and crisp. The oats in the middle of the baking sheet may need additional time to brown. Let cool completely. Add any dried fruit or nuts after granola is cool. Store in an airtight container. Yummy! I love making granola with applesauce, so I’m definitely going to make this sometime. *o* I have also been on the lookout for the perfect granola of recipe, that will be delicious, but won’t make me feel super-guilty after eating it. This looks delicious and I will totally try it! I look forward to your other recipes!! Great to hear! I have a few other granola recipes including the one I just pasted called Healthy Stovetop Granola. You should check it out! I did and I was astounded because this morning, before I saw your recipe, I was looking for an “easy stovetop granola recipe” on google, and the one I did wasn’t great, but yours looks awesome!! Oh thanks! I hope you like it when you get a chance to make it!